Help your 3 week old baby sleep longer at night with a gentle, consistent routine. 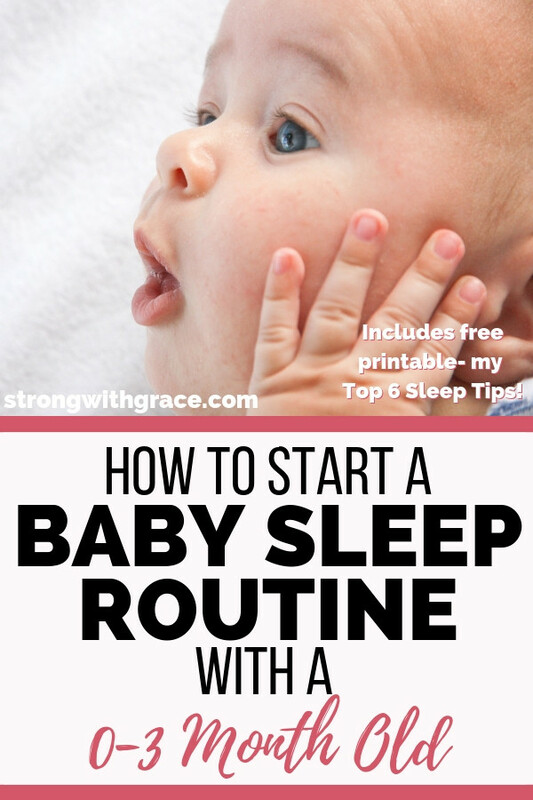 Includes a free printable of my Top 6 Infant Sleep Schedule Tips for babies 0-3 months. It was 3:00am. My new daughter had just slept 5 hours– from 10 to 3 am. She was about three or four weeks old, and I felt a huge sense of relief wash over me as I sat up on the bed and slipped my sweater over my shoulders. Our 3 week old baby sleep routine was already in motion and I liked the results so far. If this played out anything like it did with our first baby, it wouldn’t be long until we started to feel way more rested again. Not that moms ever really recover from sleep deprivation. At least, I haven’t yet, but I do have a baby, a two year old and a 5 year old. I think tired is just an extension on my name now: Heather L. Tired Goffrier. Yes, I’m very cheesy. Ha. But nothing compares to the lack of sleep you get when your baby is brand new. Do you seriously use a 3 week old baby sleep routine? Some people might question whether you can use a schedule or routine with a baby so young, but I assure you that you can (in most cases). I wrote my best sleep tips for starting an infant sleep schedule and put it into a free printable– you can grab it at the end of this article. I will say that a 3-week-old baby sleep routine is NOT a rigid, unbreakable timeline of things that must occur. It’s simply a way to start gently guiding your child toward sleeping through the night and learning that their world is predictable. When a baby’s world is predictable, they fall into their next activity with a sense of ease. It’s time to eat? Ready. Time to play? Bring it. Bed time? Swaddle me, Mama. Of course, some babies take a while to adjust to a routine. Some have health issues that require special attention. So please remember that YOU know best for your child, and always consult your doctor. So how does this gentle, predictable routine get started? Pick a plan and stick to it. You can be flexible, but if you flip back and forth on your basic strategy like a kid picking out ice cream flavors, you’re doing to drive yourself nuts. Worse, you won’t see many gains in the sleep department because your baby will be as confused as you are. It’s ok to deviate from your plan at times as you need to adjust to your baby. This is real life, not a book we’re talking about, and babies can be finicky. Go with your mom gut if you have to feed and it’s only been an hour, or if they sleep right through when you though you’d try some tummy time. Just try to get back on track so the majority of the time, you’re staying consistent. Babies thrive with consistency and routine. If you’re past the 3-week-old baby mark, it’s not too late to start. Begin slowly and plan out your days to see where you might be able to shift things into a routine. 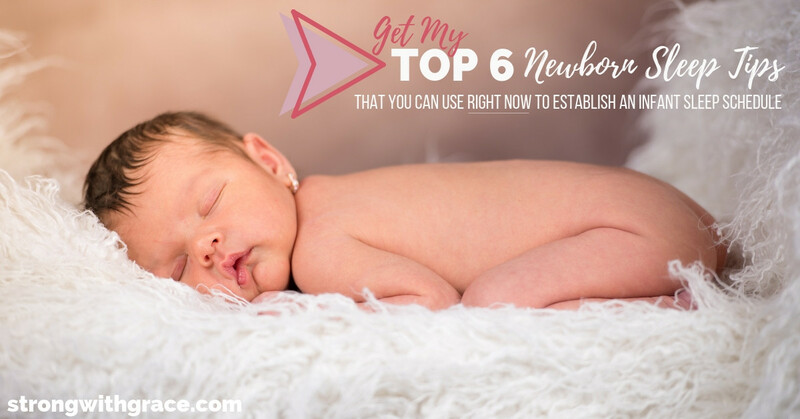 If you don’t know where to start you can grab my free download, “Top 6 Newborn Sleep Tips That You Can Use RIGHT NOW To Establish An Infant Sleep Routine.” It’s in my free parenting and encouragement resource library and you can get the password at the end of this post. It make take a few days, or a couple weeks in some cases, for baby to fully adjust, but you’ll see the benefits of an infant sleep routine soon. When baby sleeps more, Mama sleeps more. Boom. Babies cry to communicate. If we feed them every time they cry, we may be missing what they are trying to say. Newborns typically eat every two hours or so, though they could be hungry earlier, or go a bit longer between meals if they’ve been napping. Also watch for health issues such as a temperature, cough or a runny nose. You may be able to solve your baby’s issue without feeding them so soon after a previous feed. This will help you get them on a more regular eating routine. It will also give you a break from constantly nursing, whether day or night. Of course, if your baby is hungry, feed him or her! Trust your mom instincts, and if you feel there’s a serious problem, don’t hesitate to call their pediatrician or dial 9-1-1. It’s important to help babies learn to fall asleep on their own. This is a gradual process and not a rigid demand. During the first few weeks baby is home, holding and snuggling them when they’re asleep won’t derail your routine. But after about three weeks, babies start to perk up and become more sensitive to their environments. That doesn’t mean that if you allow your child to sleep on you after three weeks that you’re “spoiling” them. They need lots of snuggles. But if you want them to be able to sleep through the night at an early age, you’ll want to start helping them learn that they can fall asleep without being next to a warm body. Putting a baby down awake does not mean putting them down wide awake. It means watching for sleepy cues (more on that in the next point), then doing your bedtime or nap routine and putting them down just before they fall asleep. When you get them to the place where they are drowsy and giving you that far-off-stare, or just closing their eyes, that’s when you put them down. They are still awake but on the brink of sleep. They may startle and fuss, and then you can pick them back up until they calm down. Put them down again. It may take a few times of up and down, but soon they will conk out. ***If you are trying this when your baby is older than a few weeks, you may need to try the pick-up and put-down strategy (a highlight of the book Secrets of the Baby Whisperer) over the stretch of a couple days. Your baby has a voice. They will communicate with you the only ways they can, which is through crying and body language. It may come as a surprise that your baby’s cries aren’t all the same. If you pay attention, you will soon learn that one cry means “I’m starving,” one means “I’m tired,” and another means, “I’m hurt,” to name a few. Babies are different. Your baby may show different signs of tiredness or hunger than your friends’ children. For example, signals such as rubbing eyes or ears, yawning, or arching their back are all sleep cues. Some babies may show many of these while others only show one. Learn as much as you can about your baby’s unique voice and cues– it will help you meet their needs SO much more quickly! Napping too long during the day leads to shorter “naps” during the night. It’s time to start feeling way more rested. You don’t need much to get started, and you probably already have everything on this list.